Sometimes you love or hate an app so much that you want to tell the world about it. 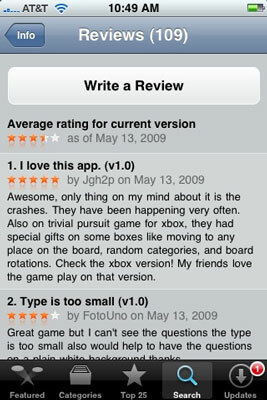 In that case, you can write a review of any app directly from your iPhone. Tap the Write a Review button. Tap one to five of the dots at the top of the Submit Review screen to rate the app. In the Title field, type a title for your review. After you submit your review, Apple reviews your submission. As long as it doesn’t violate the (unpublished) rules of conduct for app reviews, it will appear in a day or two in the App Store, in the Reviews section for the particular app.